When I began the Whole-Grain Challenge earlier this month, I thought perhaps it would help me to find ways to integrate more whole grains into my daily diet. While it has done that, the big surprise to me so far has been my discovery of some entirely new foods: millet, which I have always thought was just for the birds; and farro, which . . . well . . . I always thought was just for the Pharaohs. But the biggest revelation of all has been oat groats, a simpler variation of one of our most common Western cereal products: the lowly oat. Though I love souped-up breakfasts such as bacon and eggs, omelets, etc., I try to limit these to special occasions (although my recent reading of In Defense of Food is making me reconsider this). My typical breakfast, which I consume probably 80 percent of the time, is a bowl of granola with milk or yogurt, topped with whatever fresh fruit I can find. I've been eating this for years. My major complaint is that I think the makers of my brand of granola sweeten it too much, though I've been too lazy to make my own consistently or find an alternative. 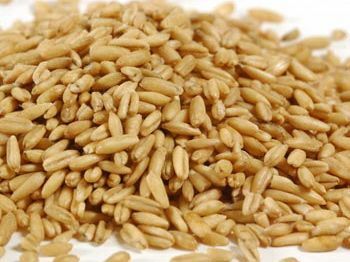 But apart from husking, and maybe a light toasting, oat groats are oats in their "wholest" edible form (you'd have to be a goat to like the husks). So if you're trying to eat more minimally processed foods, they're a great place to start. But that's not what I'm here to talk about today. I came to talk about the draft. (Damn, I like totally forgot to become a folk singer.) I'm here to say I absolutely love oat groats. Putting it nicely, I've always been ambivalent about oatmeal, which I find mushy and bland. 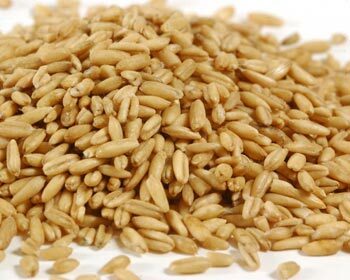 Oat groats, however, cooked for about 45 minutes in a 3:1 water:groat ratio, are great. Topped with some toasted flaxseeds and walnuts and a splash of milk. No sweetener needed. Nutty. Chewy. Interesting. Healthy. And a welcome break from 20-some years of granola. The only downside has been the long cooking time. I'm going to investigate cooking them in my Zojirushi rice cooker, which I can set on a timer the night before. (Our rice cooker — which we call "the Neuro Fuzzy" based on some quasi-technical marketing claims by the manufacturer, is almost a member of the family, its merry tunes part of many a meal.) I promise to report the results soon, with recipes and pictures (yes, 8-by-10 color glossy photos with circles and arrows and a paragraph on the back of each one). My wife has decided that oat groats are great with a little olive oil and salt, and we heard from a friend who cooks them in batches for the week. Got other ideas for oat groats? Pass 'em on — don't bogart those ideas, my friend.